Large Glass Punch Bowl and Matching Platter. Large Pressed Glass Punch Bowl with scolloped lip and Matching Platter. The bowl is 14 1/2" x 7 3/4" tall x 0.43" thick, 11.5 lbs. The platter is 21" x 3" deep x 0.375" thick, 12 lbs. Also comes with 15 matching cups and a large crystal ladle. 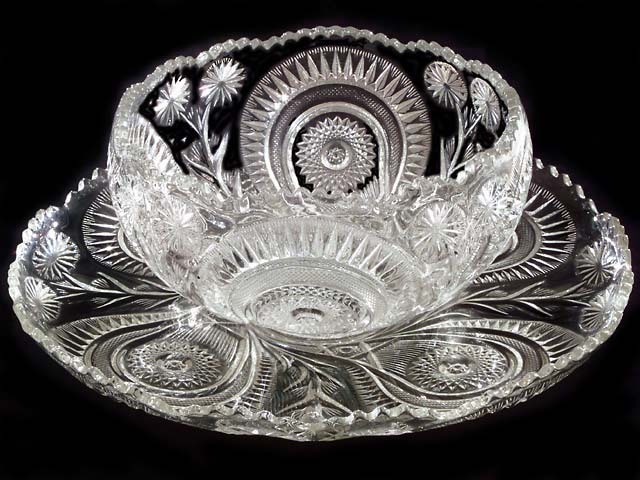 Each quadrant of the bowl is decorated with two 16 petal flashed daisies on a stem with 6 leaves adjacent to a teardrop or paisley shape with an 8 pt hobstar inside a 24 pt. hobstar surrounded by a horseshoe shaped section of crosshatching then a flashed sunburst. The base has an 8 point hobstar inside a 20 point hobstar inside a flashed sunburst. .... $325 for the full set.